Stars. Stripes. Rockets' red glare and bombs bursting in air. Deer and antelope playing. America. The United States is a country with enough national pride to fuel a superhero, and that's exactly what Captain America is all about. Does his movie tie-in handheld outing Captain America: Super Soldier channel these well enough to make you put your hand on your heart, though, or is it more inclined to make you burn a flag or two? This was developed by Griptonite, a company at which all eyes are currently pointed as SEGA is trusting it with the anticipated reawakening of the Shinobi franchise. This too is a side-scrolling platformer, and fans will delight in knowing that the studio does a serviceable job. There are interestingly designed stages and entertaining action segments, but nothing here is without its flaws. Movement is largely dependent upon leaping about and wall-jumping, and this is generally put to imaginative use with entertaining results. There's no mind-blowing level design here, but what is on offer is enough to keep you captivated. The game is mostly reliant on combat sequences, however, and these are a mixed bag. Cap starts off with quite a low health bar, and while it fills up upon reaching the next screen, power-ups are few and far between. Your main attacks are shield-throwing, punching/kicking and grabbing/tossing, and there are a few more complex moves and combos to keep things interesting as well as the ability to block. Bad guys are quite tough, though, and you'll quickly learn to not let them surround you as they're not afraid to get in a cheap move or shoot you when you're down. Early on, before shield and health bar upgrades come into play, fights are frustrating as powerful enemies hop about to get on all sides of you, but once you're a formidable force the challenge of juggling combat between two or three enemies is a captivating activity. Beyond this, there are some simple puzzles to solve that make the experience more varied as well as two types of segment that the game could easily do without. 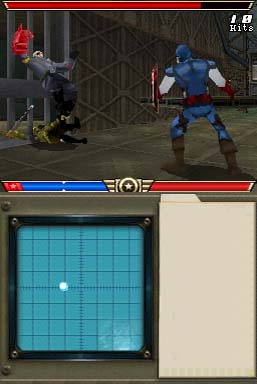 The first involves you sneaking about to take out bad guys and shoot or avoid cameras, and here Cap feels like he's moving through molasses as he goes slowly enough that enemies won't hear him. As bad guys look back and forth according to a timer and don't pick up on any noise when you quickly leap toward them, though, this feels unnecessary and frustrating. There are also segments where you must run without the ability to stop or slow down across a series of platforms, jumping to avoid gaps and enemies and collecting points along the way, but these are minimally realised and designed with little creativity, feeling like unnecessary diversions. Another flaw is a shortage of enemy types; you'll grow tired of seeing the same small collection of attack patterns by the end. There's also the poorly robots you'll face, which you can easily take out by jumping behind and pummelling their backsides. Boss battles are few but are all uniquely designed, providing a challenge that feels fair, difficult and somewhat tasking on the brain. However, the big finale is incredibly anticlimactic and disappointing. Surprisingly the game is of a decent length, and there are a few collectible items as well, including costumes and dossiers. The latter make for an interesting way to tell the plot, and while it's well-written, interesting and humorous, you'll find connections to the gameplay growing thinner as you progress. It seems like it would feel tedious to break from the adventure to read long segments of narrative, but as in the Resident Evil franchise, they're executed with enough skill and charm to keep you captivated. On the downside, a few checkpoints are quite oddly placed, and at times you'll have to repeat complex sections of increasingly tedious puzzle-based platforming each time you die during a difficult combat section that follows. The settings look good, especially in their somewhat complex backgrounds, though there's a limited variety of them. Foreground objects and characters are a different story, composed mostly of blocky, undetailed, plain ugly polygon-based objects with stilted animation that's sometimes as ridiculously simplistic as to feature only two frames per action. The lower screen also displays, for the most part, a big, basically useless radar screen. The music is decent, and there's some refreshingly well-done voice-over work as well, including enough World War II-era German accents and "Heil Hitler! "-reminiscent soundbites to make anyone feel patriotic. Additionally, while you control the Captain without use of the stylus, the developers bring this tool into play in the service of certain puzzle-solving segments, and it always feels clunky and out of place. Serviceable platforming and challenging combat in Captain America: Super Soldier is hampered by a frustrating difficulty curve, repetitive enemy types and some segments that the game could simply do without. Its positive features make this worth checking out for any Cap fan out for a decent time that will last longer than you might expect of a movie tie-in, so while it won't make you commit treason, neither will it make you pin a tiny American flag to your lapel. 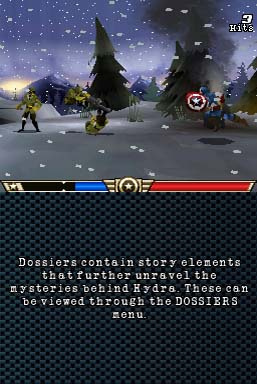 ... That actually sounds pretty good for a handheld movie tie-in, but gosh, those graphics look unfortunate. It looks like a Gameboy color game. Why did they make a DS version and not a 3DS one? @Mao Have you even seen a Gameboy colour game? These graphics may not be that good but they definitely don't look like a GBC game. I really hope they do better with Shinobi. Though by looking at their record of very mixed quality i guess i shouldn't get my hopes up too high. @LTD I would agree, but SEGA already delayed that, which gives me the impression that they're overseeing that project and not letting a subpar game come out. Hopefully it'll work! It's definitely another movie tin game, but this looks better than some others, I guess. Nintendo Power gave it a 3 so I'm guessing It's not too good of a game. It must be easier to make a game out of a movie with a Superhero in it. Well, sounds better than the Wii version. 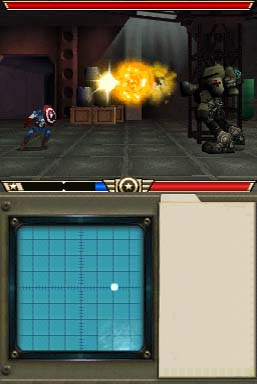 This Captain America presentation is unfortunately a mediocre game. Although I've enjoyed the fighting parts very much (stealth missions and running sections are much less fun). Bosses are challenging and there's always a chance to be hammered by the waves of enemies. 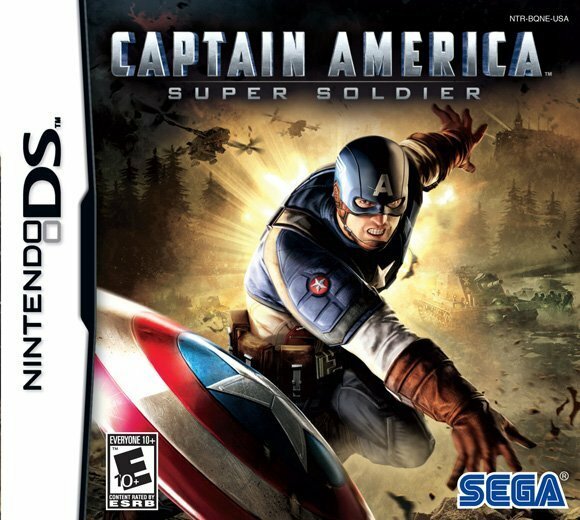 The voice acting, the background music and the WWII battle feeling are its benefits (especially the German soldiers or the unlockable extra outfits), while the poor game design sadly corrupts overall judgment (for instance the story takes place in one castle and there's no intro animation). The completion of the story took me circa 14 hours. should i get this or the 3DS version?